This image was taken near Daytona Beach, Florida from my backyard. The weather was cool outside and the atmosphere very clear. If you look at the diagram from Mr. Eclipse, it was taken just slightly past mid-eclipse time (3:17 AM). To start with, there is no way to photograph an eclipse without a tripod – and a remote cord is also very helpful. I used an AF-S Nikkor 70-300 mm 1:4.5-5.6 G lens set to aperture priority mode at F/5.6, 300mm focal length, and ISO 1600, with a resulting shutter speed of 2.0 sec. Digital Photography School ran an article that I used for a starting place. I believe some cameras can use the recommended settings using ISO 100 and F/11 or smaller but I could not get my Nikon D300 camera to take an image anywhere near these settings. Therefore, I was left with a little trial and error to figure out what would work. I tried several different F stops and ISO settings, but my camera would not take the shot with less than what I used, especially as the eclipse got closer to total. I was able to go out and take a few shots, and then download them into the computer to see what results were working best for me. That is how I determined that F/5.6 and ISO 1600 worked the best. My post- processing in Lightroom involved adding just a little HSL Luminance color enhancement with the oranges and a small amount of Clarity. Also, thank goodness for Lightroom’s improved Noise Reduction panel and Luminance slider where I could clean up a lot of the noise created by using ISO 1600. In Photoshop I only used a small Curves adjustment layer for contrast and the text. I liked my results even though I saw posted many other images using bigger and better cameras and lenses. I believe that half the fun is just trying something new that you have never done before. It was also interesting to see what the limits of your camera really are in unusual circumstances. Below is an image taken at 2:31 AM – the moon is still pretty bright having just started eclipsing and Orion is low in the west sky. This was taken with my AF-S Nikkor 10-24 mm 1:3.4-4.5G ED wide angle lens set to aperture mode F/4.8 at 18 mm focal length, 4 sec exposure, and ISO 1600. 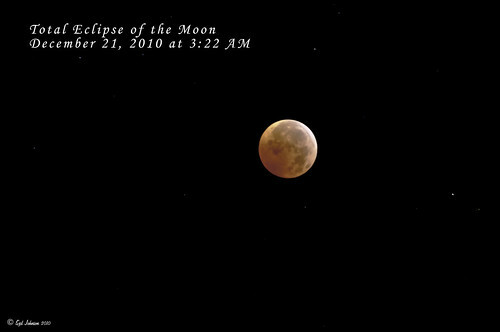 I am linking to some fabulous photos of the eclipse from the National Geographic website. Here is a link to the Bad Astronomer’s blog from 12/19/10 which has a good explanation of what actually happens during an eclipse. He links to Sky and Telescope’s excellent minute by minute description of what happened during this eclipse. I am adding another post by the Bad Astronomer blog of 12/30/10 which shows a really nice lunar image with the International Space Station leaving a shadow on the surface of the Moon as it passed by earlier in the same evening. Today’s blog had a similar image with the Solar Eclipse from earlier today in Oman. The Bad Astronomer tweeted that many people thought the ISS looks like a Star Wars TIE Fighter.